Karachi Police has launched a new mobile application 'Police4U' to facilitate residents of this metropolitan city .,.Karachi. Launch ceremony was held on Monday 14 January, 2019. AIGP Karachi, Dr. Ameer Ahmed Sheikh along with other senior officers of Sindh Police attended this ceremony. This app is developed mainly to register complaints online but it will also help to keep criminals' track record and to improve performance of Police department. This app is an initiative to change infamous Pakistani "Thaana Culture". Currently this app is available only for android mobiles. You can install it from Google Play Store. Government departments of Pakistan are entering into the digital age and many of these has already have launched their online services via SMS, web portals or mobile applications. Main purpose of this app to provide an efficient platform where users can register their complaints easily. Initial report can be registered by any person either he or she is a foreign citizen visiting Karachi or an overseas Pakistani can also lodge his complaint. Citizens of Karachi can avoid hectic procedure of registering a complaint by physically visiting a Police Station and then undergoing a lengthy question answer session of Policemen. Through this app, you simply open the app on your mobile phone, fill basic information about your complaint. Complaint will be received immediately in concerned police station, SSP, CPLC and other departments. Police will contact affected person upon receiving complaint. Name, CNIC number, mobile number and address of the user will be required to register on this app. 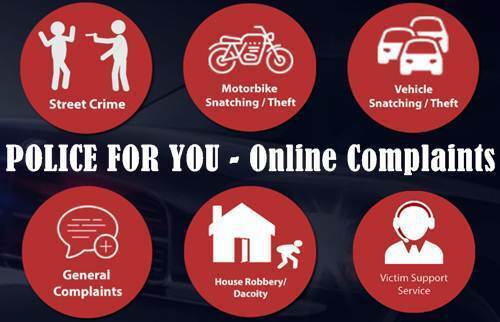 Currently this app has seven different segments; Street Crime, Motorbike Snatching/ Theft, Vehicle Snatching Theft, House Robbery/ Dacoity, General Complaints and victim support service. Dr. Ameer Ahmed Sheikh, AIGP Karachi stated that People can also use the Whatsapp number (0317-7116601) for registration of their complaints. He also added that another mobile app will also be launched soon to launch complaints against the police officials. This app is valid for all districts of Karachi; District South, Malir, Korangi, West, Central, City and East. Following is a screenshot for registering online complaint for a street crime. Following is a screenshot of the app for registering a complaint for car snatching or theft. Note: After reading users' reviews, it is found that this app needs some issues to be fixed to become more useful. However users are generally satisfied and happy for such an app.